Performers would move between Music Halls and often 'played' three or four different theatres in one evening and so it would have been impossible to tailor each performance for each of the different audiences. Thus characters were generalised and familiar landmarks were glorified so that irrespective of the social class of the audience, they would be able to understand the performer's act. 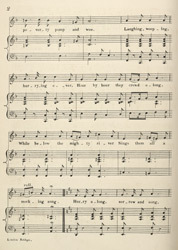 This song pays tribute to the popularity of London Bridge. As one of the few toll free bridges across the River Thames, thousand of people, of different classes as well as hundreds of horses and carriages, would have used it everyday.